Art & Design: Sausages. Lots of Sausages. First of all, let's clear some things up. The English word "sausage" refers to all types of sausages, while in many other languages (like Georgian or Russian, for instance) there are two separate words: one for the large and medium sized sausages, and the other for the small ones, also called Vienna sausages, frankfurters or weenies in English. Since this post covers both types, I need to distinguish them somehow, because they really are different products both visually and gustatorily, so let's simply call them "big" and "small." 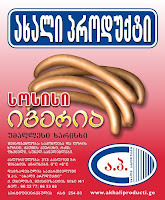 I've been working as a graphics designer since 1995, but I did my very first sausage design only in 2003, which, my dear Watsons, lets you safely deduct that this particular industry hadn't been exactly thriving in Georgia until more recently. The big sausages were mainly imported from Russia, while the local manufacturers concentrated mostly on smaller ones -- like those they put in hot dogs. 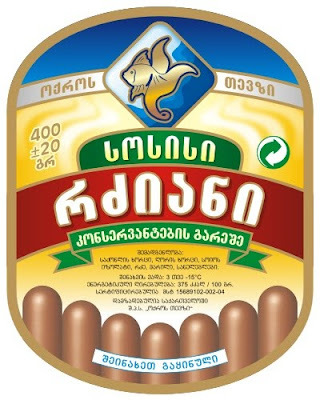 The local brands of these small sausages (most notably, Iveria and Vake) were hugely popular in Georgia, but their manufacturers never really cared how their products were represented on the shelves: they just dropped the bulks of chained sausages into the fridges and were happy. That started to slowly change lately, as more competitors appeared on the market -- both local and from abroad. So the local sausage-makers finally started to notice us, designers. 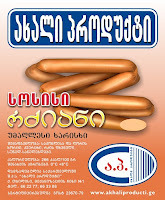 A couple of years later, a newly emerged manufacturer called Akhali Produkti ("New Product") literally heaped me up with a whole series of sausages. They were mostly based on popular Russian (or rather Soviet) sorts, like "Doktorskaya" and "Lyubitelskaya," but also included a few local brands. The pinnacle of AP's production was a special sort of sausage called "Manuel's Recipe," named after a then popular Spanish chef cook hosting a local culinary TV show. 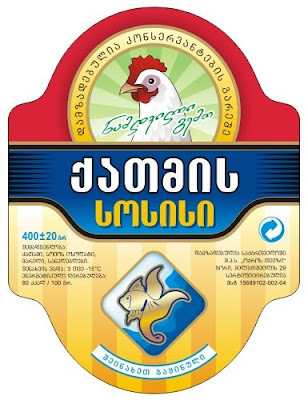 After that I had a long break from the sausages -- right until 2007, when another new customer knocked at my door: a Gori-based meat products company called Okros Tevzi ("Goldfish"). 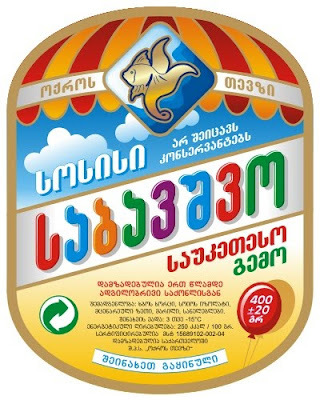 This time it was different, because the labels were to be printed directly on the sausage coating, and with the applicable printing technology (flexography, to be precise) still being in the embryonic stage here in Georgia, it provided additional challenges from the designing point of view. Fortunately, the customer soon realized, that the quality of the local flexography just wasn't enough for the proper representation of their products, so they finally switched to my favorite offset printing, ordering me a series of stickers for their main brands. 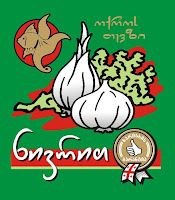 Last month I received another order from Gori for their new line of small frozen sausages in vacuum packs, three labels in total: Chicken, Milky and For Kids. All three products were sized and packed identically, but since their ingredients and target markets were different, the customer requested three separate designs. That's it for now. This particular sphere of design still remains largely unexplored for me, and I'm definitely looking forward to more "sausage orders."